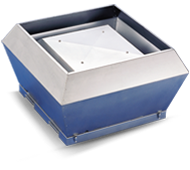 They are suited to ducted vertical exhaust applications, include a removable windband that provides easy access for cleaning and maintenance, and are available in 315, 355, 450, 560 and 630mm fan sizes. Can exhaust clean air and a range of toxic and noxious gases from a wide range of commercial and industrial applications. Ideal for applications requiring an all metal construction and where the amount of air required varies according to demand. Can be pre-configured to suit specific sensors and applications, and are supplied standard with 0-10V control input.